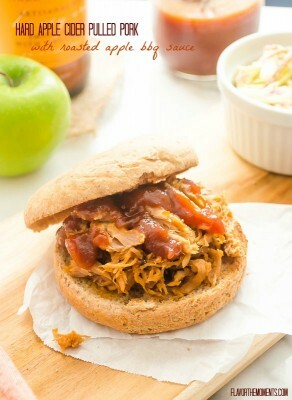 Hard Apple Cider Pulled Pork with Roasted Apple Barbecue Sauce is tender pulled pork with plenty of tangy, apple flavor. It's a win for Game Day and busy weeknights! Place the salt, pepper, cumin, coriander, brown sugar, cardamom, onion powder, and garlic powder in a small bowl and stir to combine. Rub the pork generously with the spice rub (you will have some rub left over), and place in the refrigerator uncovered for a minimum of 2 hours but preferably overnight to dry brine. When ready to cook, place the pork shoulder in the slow cooker and pour in the hard apple cider. Cover and cook on low for 8-10 hours, or until the meat shreds easily with a fork. Remove from the slow cooker, shred, and set aside. Preheat the oven to 375 degrees. Toss the apples with the olive oil, brown sugar, cinnamon, and cardamom on a large rimmed baking sheet and spread in a single layer. Roast for 15 - 20 minutes until softened. Set aside. Place the ketchup, honey or agave, apple cider vinegar, Worcestershire, garlic powder, onion powder, smoked paprika, cayenne pepper, dash of liquid smoke, and salt to taste in a small saucepan and cook over medium low heat till bubbly. Continue to cook another 2-3 minutes. Pour the mixture into a blender with the roasted apples and mix until smooth. Taste the sauce and adjust the salt and sweetener to your preferences. Toss the pork with the preferred amount of barbecue sauce, and enjoy! The pork is most flavorful if it's allowed to dry brine in the refrigerator overnight before cooking. Expect to use about half of the spice rub on a 3 lb. pork shoulder. The apples and barbecue sauce can be made in advance. I suggest starting with ½ cup of sweetener in the barbecue sauce, and if you like it on the sweeter side, ¾ cup should do the trick!